Summary This is a short, well sort-of-short, story of the making of our paper: “A neutral theory of genome evolution and the frequency distribution of genes” recently published in BMC Genomics. I like the story-behind-the-paper concept because it helps to shed light on what really happens as papers move from ideas to completion. It's something we talk about in group meetings but it's nice to contribute an entry in this type of forum. I am also reminded in writing this blog entry just how long science can take, even when, at least in this case, it was relatively fast. The pre-history The story behind this paper began when my former PhD student, Andrey Kislyuk (who is now a Software Engineer at DNAnexus) approached me in October 2009 with a paper by Herve Tettelin and colleagues. He had read the paper in a class organized by Nicholas Bergman (now at NBACC). The Tettelin paper is a classic, and deservedly so. It unified discussions of gene variation between genomes of highly similar isolates by estimating the total size of the pan and core genome within multiple sequenced isolates of the pathogen Streptococcus agalactiae. 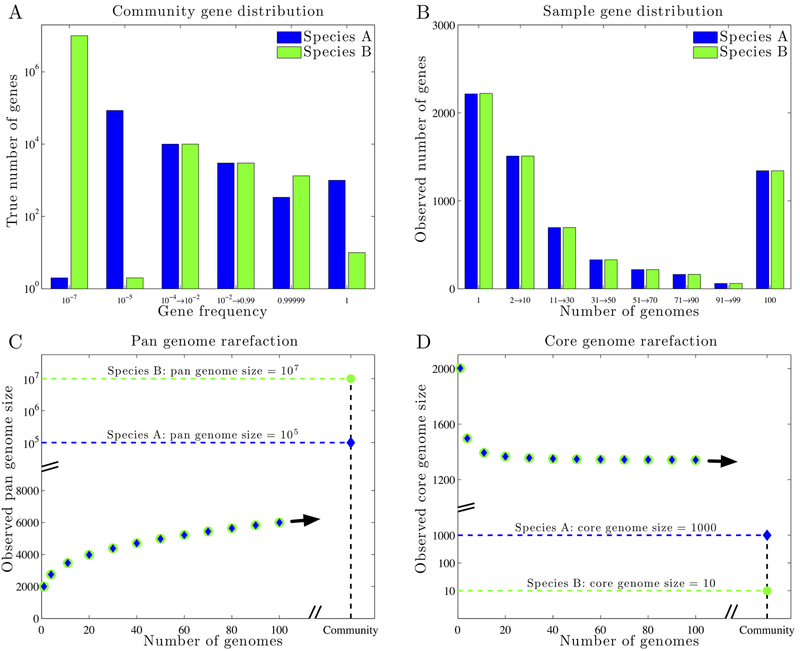 The top panels show gene frequency distributions for two synthetically generated species. Species A has a substantially smaller pan genome and a substantially larger core genome than does Species B. However, when one synthetically generates a sample set of dozens, even hundreds of genomes, then the rare genes and genomes that correspond to differences in pan and core genome size, do not end up changing the sample rarefaction curves (seen at the bottom, where the green and blue symbols overlap). Hence, extrapolation to the community size will not necessarily be able to accurately estimate the size of the pan and core genome, nor even which is larger! As an alternative, we proposed a metric we termed “genomic fluidity” which captures the dissimilarity of genomes when comparing their gene composition. The quantitative value of genomic fluidity of the population can be estimated robustly from the sample. Moreover, even if the quantitative value depends on gene alignment parameters, its relative order is robust. All of this work is described in our paper in BMC Genomics from 2011: Genomic fluidity: an integrative view of gene diversity within microbial populations. However, as we were midway through our genomic fluidity paper, it occurred to us that there was one key element of this story that merited further investigation. We had termed our metric "genomic fluidity" because it provided information on the degree to which genomes were "fluid", i.e., comprised of different sets of genes. The notion of fluidity also implies a dynamic, i.e., a mechanism by which genes move. Hence, I came up with a very minimal proposal for a model that could explain differences in genomic fluidity. As it turns out, it can explain a lot more. We proceeded based on our physics and theoretical ecology backgrounds, by writing down master equations for genomic fluidity as a function of all three events. It is apparent that reproduction decreases genomic fluidity on average, because after a reproduction event, two genomes have exactly the same set of genes. Likewise, gene transfer (in the original formulation) also decreases genomic fluidity on average, but the decrease is smaller by a factor of 1/M, because only one gene is transferred. Finally, mutation increases genomic fluidity on average, because a mutation event occurring at a gene which had before occurred in more than one genome, introduces a new singleton gene in the population, hence increasing dissimilarity. The model was simple, based on physical principles, was analytically tractable, at least for average quantities like genomic fluidity, and moreover it had the right tension. It considered a mechanism for fluidity to increase and two mechanisms for fluidity to decrease. Hence, we thought this might provide a basis for thinking about how relative rates of birth-death, transfer and uptake might be identified from fluidity. As it turns out, many combinations of such parameters lead to the same value of fluidity. This is common in models, and is often referred to as an identifiability problem. However, the model could predict other things, which made it much more interesting. The key moment when the basic model, described above, began to take shape as a paper occurred when we began to think about all the data that we were not including in our initial genomic fluidity analysis. Most prominently, we were not considering the frequency at which genes occurred amongst different genomes. In fact, gene frequency distributions had already attracted attention. A gene frequency distribution summarizes the number of genes that appear in exactly k genomes. The frequency with which a gene appears is generally thought to imply something about its function, e.g., "Comprising the pan-genome are the core complement of genes common to all members of a species and a dispensable or accessory genome that is present in at leastbone but not all members of a species." (Laing et al., BMC Bioinformatics 2011). The emphasis is mine. But does one need to invoke selection, either implicitly or explicitly, to explain differences in gene frequency? And, when we began to think more about our model, we realized that the tension that led to different values of genomic fluidity also generated the right sort of tension corresponding to U-shaped gene frequency distributions. On the one-hand, mutations (e.g., uptake of new genes from the environment) would contribute to shifting the distribution to the left-hand-side of the U-shape. On the other hand, birth-death would contribute to shifting the distribution to the right-hand side of the U-shape. 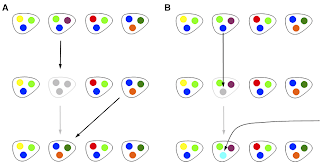 Gene transfer between genomes would also shift the distribution to the right. Hence, it seemed that for a given set of rates, it might be possible to generate reasonable fits to empirical data that would generate a U-shape. In doing so, that would mean that the U-shape was not nearly as informative as had been thought. In fact, the U-shape could be anticipated from a neutral model in which one need not invoke selection. This is an important point as it came back to haunt us in our first round of review. So, let me be clear: I do think that genes matter to the fitness of an organism and that if you delete/replace certain genes you will find this can have mild to severe to lethal costs (and occasional benefits). However, our point in developing this model was to try and create a baseline null model, in the spirit of neutral theories of population genetics, that would be able to reproduce as much of the data with as few parameters as possible. Doing so would then help identify what features of gene compositional variation could be used as a means to identify the signatures of adaptation and selection. Perhaps this point does not even need to be stated, but obviously not everyone sees it the same way. In fact, Eugene Koonin has made a similar argument in his nice paper, Are there laws of adaptive evolution: "the null hypothesis is that any observed pattern is first assumed to be the result of non-selective, stochastic processes, and only once this assumption is falsified, should one start to explore adaptive scenarios''. I really like this quote, even if I don't always follow this rule (perhaps I should). It's just so tempting to explore adaptive scenarios first, but it doesn't make it right. At that point, we had a model, solutions, fits to data, and a message. We solicited a number of pre-reviews from colleagues who helped us improve the presentation (thank you for your help!). So, we tried to publish it. We tried to publish this paper in two outlets before finding its home in BMC Genomics. First, we submitted the article to PNAS using their new PNAS Plus format. We submitted the paper in June 2011 and were rejected with an invitation to resubmit in July 2011. One reviewer liked the paper, apparently a lot: "I very much like the assumption of neutrality, and I think this provocative idea deserves publication." The same reviewer gave a number of useful and critical suggestions for improving the manuscript. Another reviewer had a very strong negative reaction to the paper. Here was the central concern: "I feel that the authors' conclusion that the processes shaping gene content in bacteria and primarily neutral are significantly false, and potentially confusing to readers who do not appreciate the lack of a good fit between predictions and data, and who do not realise that the U-shaped distributions observed would be expected under models where it is selection that determines gene number." There was no disagreement over the method or the analysis. The disagreement was one of what our message was. I still am not sure how this confusion arose, because throughout our first submission and our final published version, we were clear that the point of the manuscript was to show that the U-shape of gene frequency distributions provide less information than might have been thought/expected about selection. They are relatively easy to fit with a suite of null models. Again, Koonin's quote is very apt here, but at some basic level, we had an impasse over a philosophy of the type of science we were doing. Moreover, although it is clear that non-neutral processes are important, I would argue that it is also incorrect to presume that all genes are non-neutral. There's lots of evidence that many transferred genes have little to no effect on fitness. 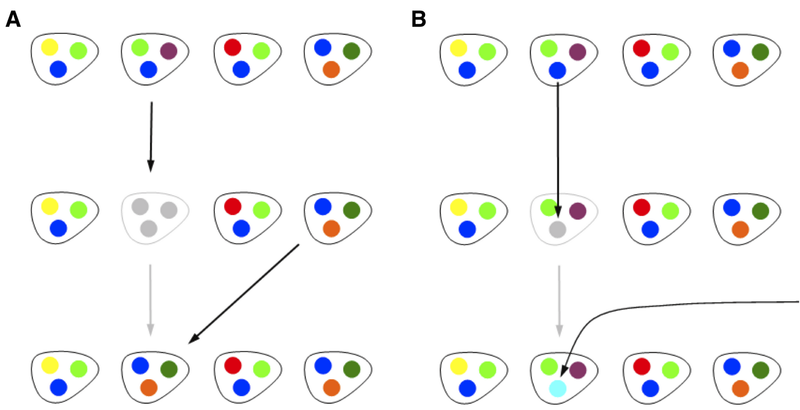 We revised the paper, including and solving alternative models with fixed and flexible core genomes, again showing that U-shapes are rather generic in this class of models. We argued our point, but the editor sided with the negative review, rejecting our paper in November after resubmission in September, with the same split amongst the reviewers. Hence, we resubmitted the paper to Genome Biology, which rejected it at the editorial level after a few week delay without much of an explanation, and at that point, we decided to return to BMC Genomics, which we felt had been a good home for our first paper in this area and would likely make a good home for the follow-up. A colleague once said that there should be an r-index, where r is the number of rejections a paper received before ultimate acceptance. He argued that r-indices of 0 were likely not good (something about if you don't fall, then you're not trying) and an r-index of 10 was probably not good either. I wonder what's right or wrong. But I'll take an r of 2 in this case, especially because I felt that the PNAS review process really helped to make the paper better even if it was ultimately rejected. And, by submitting to Genome Biology, we were able to move quickly to another journal in the same BMC consortia. Bart Haegeman and I continue to work on this problem, from both the theory and bioinformatics side. I find this problem incredibly fulfilling. It turns out that there are many features of the model that we still have not fully investigated. In addition, calculating gene frequency distributions involves a number of algorithmic challenges to scale-up to large datasets. We are building a platform to help, to some extent, but are looking for collaborators who have specific algorithmic interests in these types of problems. We are also in discussions with biologists who want to utilize these types of analysis to solve particular problems, e.g., how can the analysis of gene frequency distributions be made more informative with respect to understanding the role of genes in evolution and the importance of genes to fitness. I realize there are more of such models out there tackling other problems in quantitative population genomics (we cite many of them in our BMC Genomics paper), including some in the same area of understanding the core/pan genome and gene frequency distributions. I look forward to learning from and contributing to these studies. I enjoyed reading your genome fluidity paper. One thought I had while reading it was if it would be possible to transfer this approach to evaluating species diversity in an environment? The most common approach is building rarefaction curves for variable regions in rRNA genes. If I have understood your article then these rarefaction curves are also susceptible to the finding rare genes problem you describe. I wonder if you could use genomic fluidity to estimate species diversity in an environment using multiple loci? If so do you think this could be more robust than using a single rRNA region? The above comment is me. I should have logged in first. Thanks for the feedback. In fact, we are in the midst of finishing up a paper on the first topic you asked about, i.e., rarefaction curves and species diversity. Bart and I are working on this with a group of mathematicians and biologists. As for the second issue, I have not thought about this at all, seems interesting but still may face the same fundamental issues we raised. Thanks for a very interesting post. I was surprised by "There's lots of evidence that many transferred genes have little to no effect on fitness." Could you elaborate? It seems inconsistent with the observation that recently acquired ORFans in E. coli are under purifying selection (Daubin & Ochman 2004). Also, is "little" effect on fitness relative to the 1/Ne threshold of the nearly neutral model, or relative to what we can easily measure in the lab? "Horizontal gene transfer, genome innovation and evolution"
"Although these apparently transient genes are under purifying selection, this selection is weak." "The notion that many of these non-core genes might be selectively neutral or nearly neutral is also suggested by recent studies of a marine bacterioplankton population of Vibrio splendidus by Thompson et al." There are lots of nice references in the review. In terms of non-neutral extensions to our model (some of which we are considering), the strength of selection and population size operate together. Of course, one could also get U-shapes with selection. But, our intention in this first paper was to show that U-shapes don't require invoking selection, contrary to what might seem necessary at first glance, which is somewhat of our point. I looked at the review, which was interesting, but I don't really agree with the quotes. The first quote is discussing selection on ORFans (Daubin & Ochman 2004), which is weaker than for other genes but is still far from neutrality (Ka/Ks = 0.19). And the Thompson et al. has been superseded by more work from the same group that found ~25 populations and specialization in at least 6 different habitats within that "population" of Vibrio splendidus (Resource Partitioning and Sympatric Differentiation Among Closely Related Bacterioplankton, Science 2008). More broadly, I think most of the genes affect fitness, but they have multiple impacts and the sign of the fitness effect varies by environment. (This is my interpretation of the genome-wide fitness data that is starting to come out.) I wonder if this fluctuating selection should lead to similar results in population models as neutral evolution does. Thank you for your post. While I have read and enjoyed the genome fluidity paper, I have not yet had a chance to read this one so please forgive my ignorance on the subject. My understanding of your model (simulation) is as follows: in the reproductive step, a bacterium (one organism of the population) is (randomly) chosen to die (which seems reasonable). But then, to replace that individual, one (randomly selected) bacterium is chosen to replace that individual. That individual has double the fitness of the rest of the individuals (say, bacteria) in the population. Is it reasonable to assume that one bacterium in a population of "con-specifics" could have its fitness doubled by a stochastic process (and what's more, this happens many different times in the course of a simulation)? If I am not mistaken, the effective population size of most bacterial species is often orders of magnitude higher than 10^9 which usually precludes stochastic events from altering the fitness of one organism (and not its surrounding con-specifics who would share nearly identical attributes, genotypically and phenotypically speaking) that dramatically. Thoughts? Am I missing something? Kevin - I think there is some confusion. Each individual has the same fitness. One organism is chosen to replace the removed individual, but that does not mean it has twice the fitness of the others. All organisms have the same probability of being removed and, amongst those that are not removed, all have the same probability of being chosen to reproduce. This is what the Moran model does in other contexts. Please take a look at our paper and let me know if you have more questions.